Jessica’s note: I have a serious love of Brussels sprouts. Usually I roast them, but after trying them shredded in this salad I discovered how amazing they are raw, too. 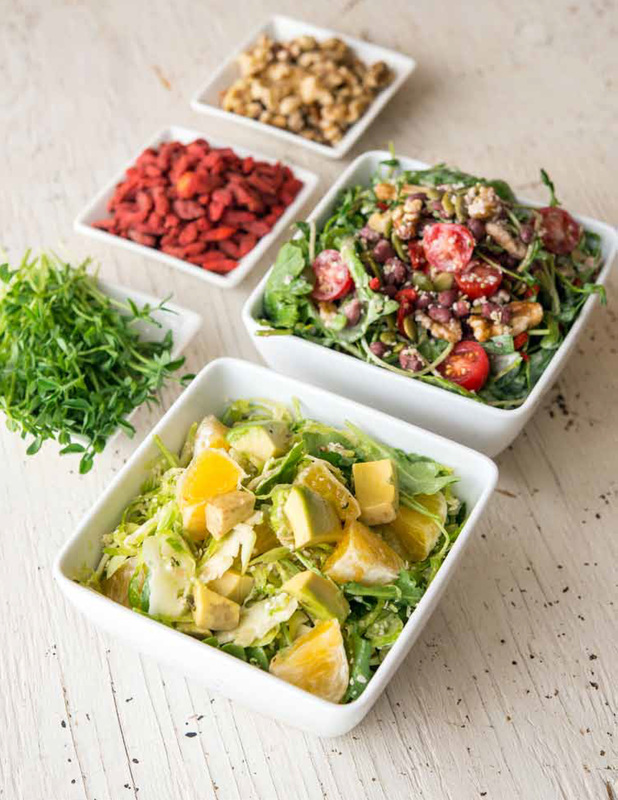 Lake all brassica-family veggies they are chock full of antioxidants and blood-healthy vitamin K, and the avocado and hemp offer heart-healthy omega fats. 1. Peel any browned leaves from the sprouts, but don’t trim their ends—this gives you something to hold onto. 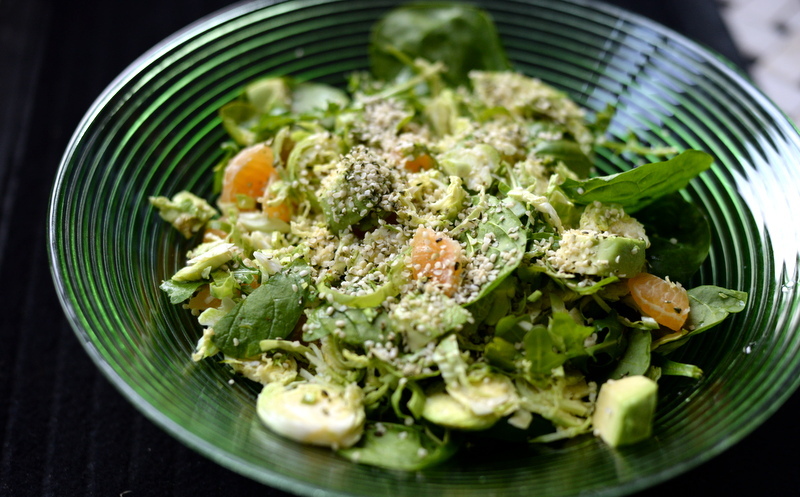 Shave the sprouts finely, then place them in a large salad bowl with the arugula. 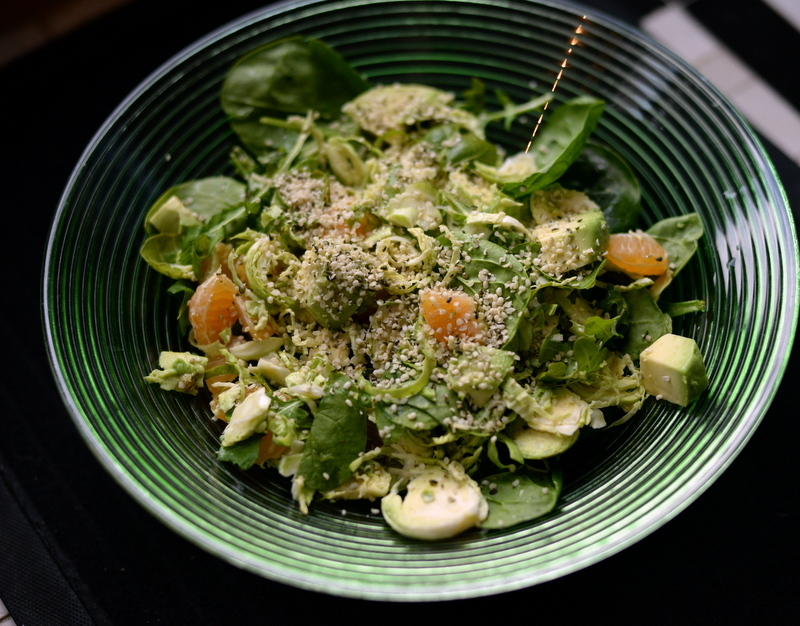 Peel and dice the orange and avocado and add them to the bowl with the hemp seeds. 2. Mix the remaining ingredients together to create a simple vinaigrette, season to taste, then toss into the salad and serve. GREEN TIP: There’s more than one way to shave a Brussels sprout. Use a mandolin and box grater, a food processor fitted with the slicing attachment, or by hand with a sharp knife. My favourite green at the moment is bok choy. I like to saute it in a thai chili garlic sauce. Thanks for this wonderful giveaway Janet. What a nice book 🙂 My favorite green is definitely kale. It might sound boring but I’m a huge fan of kale salad with a creamy dressing, green smoothies with kale, kale pesto, kale chips, kale in my fresh juice, in soups, stew, spaghetti sauce, in puree with potatoes, etc. My favorite is probably plain ol’ spinach, because it’s so mild and versatile and it’s easy to keep a big bowl of it on hand to toss into everything. Also? It’s the one green my picky big kid will accept! Thanks for this giveaway! 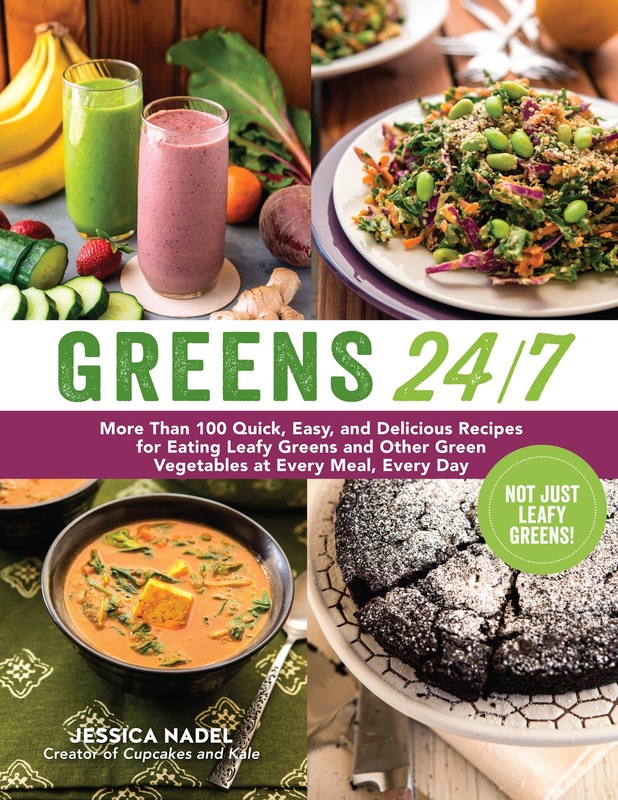 Sounds like a fabulous cookbook, especially for those of us who are always looking for ways to increase green veggie intake among family members. My favorite green, hands down, is bok choy. A sterling source of calcium, bok choy is infinitely versatile. Smoothies, salads, soups…now I’m even inspired to try pureeing it into a brownie-style recipe. I think rainbow chard is my favorite green veggie. I make a skillet meal with chard, gnocchi and white beans that everyone loves. Zucchini! I just cut it up raw and eat it with just about everything! Yes to all the greens! I definitely need to get my hands on some brussels sprouts one of these days. 🙂 So good. I can’t pick a favorite green! Kale? Arugula? Chard? Eat all the greens! Gotta love roasted brussels sprouts! Thanks for the giveaway, Janet. I love all greens and veggies, but, currently, my favorite is sauteed broccoli with garlic and pepper flakes. SO good! And, I LOVE raw kale salads with creamy, nut-based dressings. Kathy over at Happy Healthy Life has an AMAZING kale and corn salad with a miso dressing that I just ADORE! i say wowsers, too. we are nerds of the same pod. 🙂 this salad does look super pretty! i’d like to use hemp in more than just smoothies — thanks for the reminder! Choosing just one green … Brussels, any leafy green, cilantro, broccoli (of course), zucchini, beans, how can I choose? A stand-by favourite when I can’t choose is roasting any of them in lemon juice and thyme, just so they get those dark charred bits. Amazing. My favorite green is Brussels sprouts and I like to slice them and roast in oil (olive or coconut) and seasonings (salt, pepper, and whatever spice I’m in the mood to eat). my favorite green is bok choi sautéed in garlic and ginger. Even better if it’s baby bok choi. This book sounds great! My favorite green ingredient is kale. I love it sautéed in olive oil with garlic. Brussel sprouts I love just steamed a bit with balsamic vinegar…fresh from my garden. Baby Kale is my new favorite green. I use it in recipes instead of baby spinach. thanks for a great giveaway. 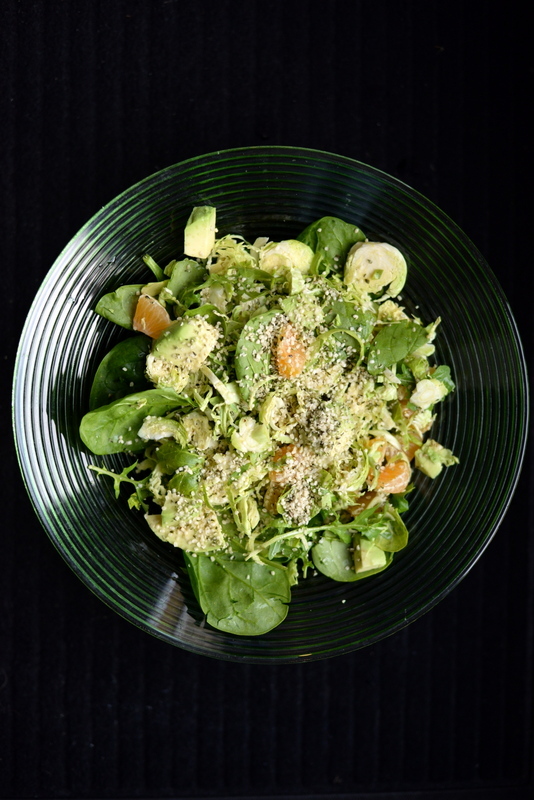 Love adding spirulina to my salad. Earthy flavor. Book looks great, thanks for the give away! My favorite green is kale — I love it in smoothies! I am addicted to steamed broccoli. I eat it plain for a snack. Thanks for the giveaway! The cookbook looks great, as does the salad! I’m really into shaved brussels salads lately, too – I mix up the leafy green base, but this week have been using swiss chard. Congratulations, Tara! You won the giveaway. Please check your email for more information. These days, I have a thing for bok choy. I prepare and eat it very simply: steamed, with a drizzle of olive oil and a sprinkle of nutritional yeast. Delicious! My current favourite green is arugula; it lasts well & seems to go with anything. Kale is definitely my favorite leafy green. I love to just steam it plain and eat it alongside all of my meals. I also absolutely love celery and sugar snap peas — I feel like these are great ingredients that people often forget about. I love spinach because it is so easy to add to almost anything. The book sounds perfect. My current favourite green is broccoli but I pretty much love all greens. This salad sounds great, Janet! I’m not a fan of raw brussels sprouts, I’m inclined to roast them before shaving them in the salad. This is such a pretty salad and I love the combination of ingredients–especially the pop of color and sweetness from the clementines. Thanks for sharing it with Souper Sundays this week.